From http://blog.urbannatureculture.com/?p=220, a wonderful site well worth your visit. A recent flap in Eureka Springs focused attention on the peculiar activity of ‘yarn bombing.’ This is where people obsessed with knitting/crochet apply their talents to public spaces in the name of art. In Eureka Springs, this includes wrapping tree trunks in complex patterns of colorful yarn. No wonder a resident who sees these vibrantly adorned trees in the park across from her home allegedly, under cover of darkness, cut the yarn and freed the trees. I do understand how the artist(s) who had applied themselves to these difficult tasks would feel hurt that their artistic talents were so rudely destroyed. On the other hand, I’m afraid my sympathy in this case lies with the vandal. Parks are, after all, supposedly places where everyone can enjoy the beauty of nature, set aside in cities where everything else bears the heavy hand of humanity. Why gild the lily? Aren’t trees fascinating and beautiful enough on their own? I get that creations of yarn probably don’t stand well on their own in a public venue, but then, perhaps that’s a challenge for yarn artists to figure out rather than glomming onto nature’s talents. And while I’m on the subject, what about those stacked rocks now cropping up in public spaces around the country? Who exactly wants to go to a wilderness like the Buffalo River and come across someone’s self-important effort to be noticed? 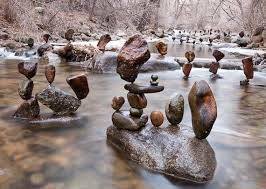 Wow, man, how cool is that guy, stacking all those rocks so carefully? Who gets off on venturing to a remote rural stream only to find the tracks of other humans? Isn’t that why we go out to embrace Nature in the first place, to leave behind the streets, noise, neon lights, exhaust fumes, shouts and cries, and all the other overwhelming and increasingly inescapable evidence of human habitation? It doesn’t matter if the trace of other humans appears in the form of discarded fast food containers, rusting appliances, or yarn art. What matters is that we somehow come to an agreement that common spaces meant to preserve some tiny fragment of Nature remains exactly that—Nature. Same goes for those Western lands currently contested by farmers who think they have some kind of God-given right to use public lands. 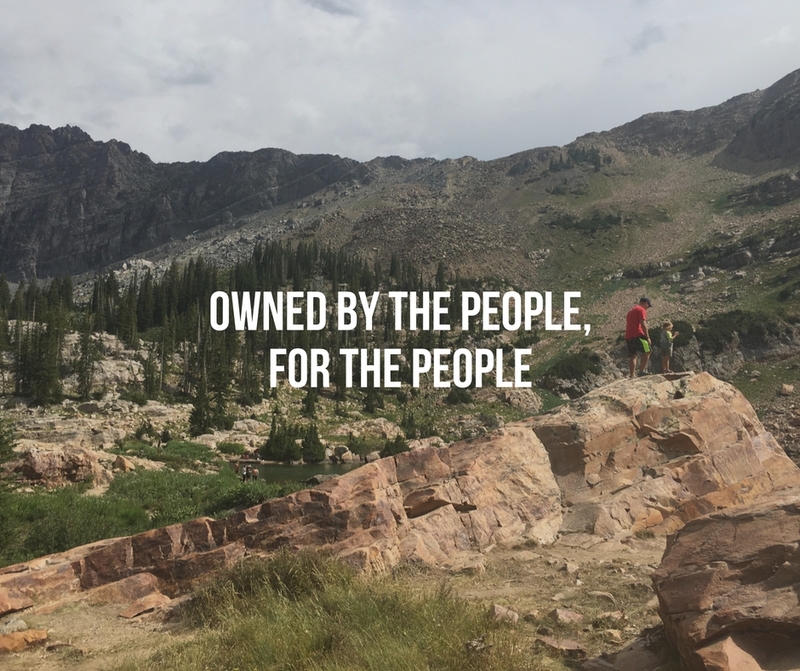 If it’s “public lands,” that means it’s for all of us, NOT for an individual. Federal law needs to change so that no one gets dibs on public lands, not to be leased for running cattle any more than they should be leased for oil and mineral exploration. These destructive processes permanently mar the landscape, change the entire ecosystem, and leave only the heavy footprints of humans. So about those hiking/biking trails through our Northwest Arkansas cities. Why must these be pockmarked with works of art? Are we really so inured to the natural wonders of our environment that we can’t exist without putting our mark everywhere? Artworks are fine in museums, in front of fancy buildings, and even in the public square. Why is it necessary to drape the natural landscape of trail routes with reminders of people? This is similar to the systematic abuse of music, another art form, by layering it into every single waking moment–television programs and movies, elevators, every store and office, every trip to anywhere. What about extended periods of silence? What about music as a singular amazing rendering of an art form worthy of our attention? I have nothing against art. But putting art where it doesn’t belong is as much a violation of art as ignoring art entirely. Let’s create art parks where people visit to enjoy visual art. Maybe rotate installations surrounded by tended beds of colorful flowers, fountains, and other contributions from the natural world. But art in such settings is the key feature, not a bit thrown in here and there where people visit for other reasons besides art. Art museums, art galleries, art installations in designated public places—these are venues where art belongs, not superimposed on places meant to be natural. Maybe this is a discussion to be held in any community. Where does art fit best in our town? Where can we preserve Nature for everyone’s enjoyment? If we’re trying to preserve Nature, can we limit our invasion to the creation of a pathway for us to walk/bike and leave the rest untouched? Can we not at least agree to set aside places where the ham-fist of humanity is not allowed? Can we not recognize the rights of animals and plants to live undisturbed, at least in a few tiny corners of our world? Can we not pull back our tendencies to claim territory and preserve some fragments of nature amid urban spaces? 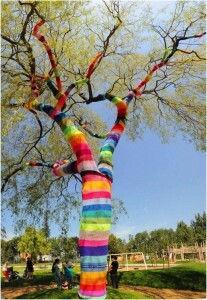 That means no yarn bombs on parkland tree trunks—unless that park is a designated art park. It means no cute stacked rocks along river banks and shorelines. We can improve on our cities by the use of Nature, but we cannot improve on Nature with the use of art. 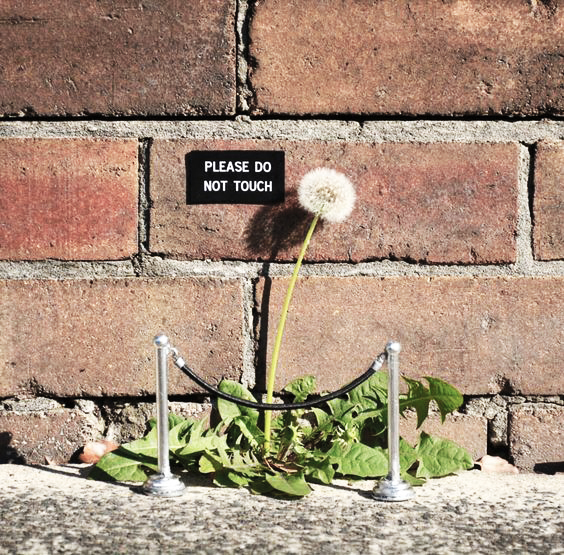 If the urge to leave your mark overwhelms you, keep it in your yard. This entry was posted in American Culture, current events and tagged art, art installations, natural space, nature, preservation, preserving nature, public art, public lands, yarn bomb on May 16, 2018 by Denele Campbell.